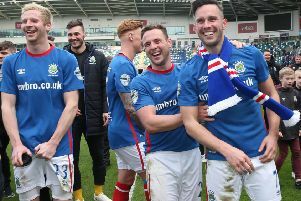 LINFIELD made a first trip to Brandywell Stadium since 2012 and it was a winning return for the Blues who clinched a victory which took them top of the Danske Bank Premiership. Almost 500 travelling Linfield supporters arrived on Foyleside for what was the first Irish League fixture at the stadium since January 1969 and a first appearance at the ground since the Setanta Cup clash against Derry City six years ago. And Institute threatened to upset the Blues who were intent on returning to winning ways as skipper, Michael McCrudden opened the scoring on 13 minutes with his seventh of the season but Linfield found the equaliser from a superb free-kick from Niall Quinn on 27 minutes. Linfield dominated the ball after the break and they hit the front in controversial circumstances as match referee, Andrew Davey over-ruled his assistant who had flagged for offside when Andy Waterworth fired into the net from close range. That goal sucked the life out of 'Stute and Linfield went on to control the match with Kirk Millar heading in a third goal before Waterworth completed his brace with four minutes to go as Linfield, momentarily at least, returned to the summit of the table. David Healy made three changes to the side which lost to Coleraine in their last outing with Joshua Robinson, Michael O'Connor and Stephen Fallon coming in for Stafford, Clarke and Cooper who dropped to the bench. 'Stute, meanwhile made just the one enforced change with regular right-back, Jake Morrow replaced by Stephen Curry. Paddy McLaughlin's men made a decent start to the game and Aaron Jarvis had the first effort on goal but fired his shot high over the crossbar. Linfield finally got in behind the 'Stute defence on 10 minutes when Stephen Fallon found the run of Christoper Casement on the right flank. The Blues right-back crossed dangerously towards Andy Waterworth at the front post but Caoimhin Bonner tracked the run and did brilliantly to intercept at the expense of a corner. It was the home side who hit the front on 13 minutes when Jarvis spun past his man before delivering an inch-perfect pass into the path of McCready who got in behind the Blues defence. The Stute striker's low, close ranged shot was saved superbly by Roy Carroll but the rebound fell kindly to McCrudden who slotted into the empty net. Linfield wasted a glorious chance for the equaliser on 22 minutes when Waterworth crossed low into the six yard box and when Jordan Stewart turned Dean Curry, he shot across the face of goal and wide. The pressure was mounting and Martin Gallagher produced a terrific one handed save to deny Jamie Mulgrew. The Blues midfielder, then won a free-kick right on the edge of the 'Stute area when he was brought crashing down by Colm McLaughlin. Up stepped Quinn to take the resultant set-piece and he curled into into the far corner of the net to get the visitors back on terms just short of the half hour mark. Stephen Curry dragged his shot wide from a promising position as 'Stute tried to get back into the game while Michael O'Connor headed just over for Linfield as the teams went in level at the break. Linfield took the lead on 58 minutes in controversial circumstances as Waterworth fired into the roof of the 'Stute net from close range. The assistant referee had raised his flag for offside but after a moments' hesitation match referee, Andrew Davey awarded the goal. That goal knocked the fight out of 'Stute and there was no such controversy with Linfield's third goal eight minutes later as Jordan Stewart's sublime cross towards the back post was headed into the net by Millar. Linfield dominated the ball in the closing stages and Waterworth completed the scoring when he recieved the ball from O'Connor and fired into the net from 12 yards. Roy Carroll had to beat away McCrudden's free-kick deep into injury time but it was Linfield who were celebrating a much needed victory. Institute: M. Gallagher; C. McLaughlin, C. Bonner, D. Curry, R. Wilson; S. Curry (C. Moorehead 69), R. Doherty, A. Jarvis, G. Brown (J. Dunne 69); M. McCrudden, J. McCready (D. Henderson 75); Subs Not Used - A. Harkin, M. Scoltock, J. Morrow, J. McIntrye. Linfield: R. Carroll; C. Casement, J. Callacher, J. Robinson, N. Quinn; K. Millar (J. Cooper 75), J. Mulgrew, S. Fallon (R. Garrett 82), J. Stewart (M. Clarke 85) M. O'Connor, A. Waterworth; Subs Not Used - M. Stafford, B Doyle, D. Reynolds. G. Deane.